I’m absolutely entranced by FKA twigs. After (regretfully) sleeping on her first full length record LP1 for far too long, I finally checked it out by recommendation of many a ‘best of 2014’ list and was instantly drawn in by haunting, almost ethereal vocals and delicate poppy synths. Whilst I am somewhat under-informed about the underground scene from which she has emerged, as a breakthrough artist to the mainstream listener she is clearly something special. I then backtracked to EP1 and EP2, and read up a little on her musical background of growing up listening to punk, and career as a back-up dancer for the likes of Jessie J, and was completely sold! As great as her music is, visuals are an equally significant part of FKA twigs. Her big doe eyes and bee-stung doll lips are unmistakeable, and the importance of aesthetics and performance are made obvious by twigs’ stunning music videos. I am referring in particular to her most recent for Pedulum, her first self-directed video (although she has clearly played a big role in establishing the artistry of others) which features twigs suspended from a ceiling in various contorted silhouettes – it is difficult to do the piece justice using words, but it is an absolute must-watch. Self-directing allowed twigs to really experiment with and celebrate female sexuality away from the omnipresent male gaze of the music industry, and the result is truly beautiful. 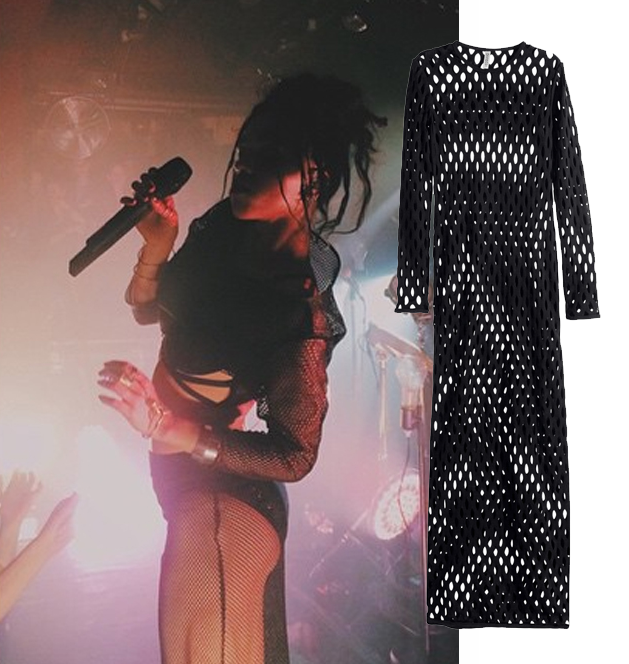 This brings me onto what is really the main point of this post – FKA twigs’ style. She is a sparkling example of how pop star (despite her music being difficult to label, I think it is fair to call twigs a pop star), does not have to mean pink and preppy and can encompass a more (for want of a better word) ~alternative aesthetic. In both her ‘off duty’ and her stage wear, she is unique without being too crazy and ‘out there’ a la Lady Gaga circa 2009; layering is key in many of her looks, and she often wears small independent designers (even things made by her talented friends), as well as a mix of high fashion and high street. I think she strikes the balance between ‘quirky’ and wearable just right, in such a way that means that her style isn’t easy to imitate or replicate exactly (part of her appeal as a really individual artist), but it is definitely possible to pull some inspiration from. I’ve picked out a few things from H&M’s latest Divided collection (pictured above and below) which I think have an FKA twigs vibe about them – wear them together or mix with vintage to nail her eclectic style. Definitely can appreciate your new love for FKA Twigs! Her style can indeed be replicated and has become such a style influence aka Rihanna and Zoe Kravitz.